Scientists presents a highly adaptable solution to creating yeast biohybrids with enhanced metabolism driven by light energy. 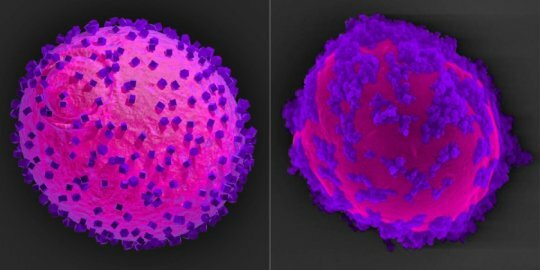 The researcher's model of a yeast cell (magenta) with semiconductor nanoparticles (purple) attached to its surface (left) corresponds with their SEM analysis of the completed biohybrid system (right). The semiconductors capture electrons from light and hand them over to the cell where they drive the shikimic acid metabolic pathway. Genetically engineered microbes such as bacteria and yeasts have long been used as living factories to produce drugs and fine chemicals. More recently, researchers have started to combine bacteria with semiconductor technology that, similar to solar panels on the roof of a house, harvests energy from light and, when coupled to the microbes' surface, can boost their biosynthetic potential. The first "biological-inorganic hybrid systems" (biohybrids) mostly focused on the fixation of atmospheric carbon dioxide and the production of alternative energies, and although promising, they also revealed key challenges. For example, semiconductors, which are made from toxic metals, thus far are assembled directly on bacterial cells and often harm them in the process. In addition, the initial focus on carbon-fixing microbes has limited the range of products to relatively simple molecules; if biohybrids could be created based on microorganisms equipped with more complex metabolisms, it would open new paths for the production of a much larger range of chemicals useful for many applications. Now, in a study in Science, a multidisciplinary team led by Core Faculty member Neel Joshi and Postdoctoral Fellows Junling Guo and Miguel Suástegui at Harvard's Wyss Institute for Biologically Inspired Engineering and John A. Paulson School of Engineering and Applied Sciences (SEAS) presents a highly adaptable solution to these challenges. "While our strategy conceptually builds on earlier bacterial biohybrid systems that were engineered by our collaborator Daniel Nocera and others, we expanded the concept to yeast -- an organism that is already an industrial workhorse and is genetically easy to manipulate -- with a modular semiconductor component that provides biochemical energy to yeast's metabolic machinery without being toxic," said Joshi, Ph.D., who is a Core Faculty member at the Wyss Institute and Associate Professor at SEAS. Co-author Nocera is the Patterson Rockwood Professor of Energy at Harvard University. As a result of the combined manipulations, yeasts' ability to produce shikimic acid, an important precursor of the anti-viral drug Tamiflu, several other medicines, nutraceuticals, and fine chemicals, was significantly enhanced. The baker's yeast Saccharomyces cerevisiae naturally produces shikimic acid to generate some of its building blocks for the synthesis of proteins and other biomolecules. However, by genetically modifying the yeast's central metabolism, the researchers enabled the cells to funnel more of the carbon atoms that their main nutrient source, the sugar glucose, contains into the pathway that produces shikimic acid and prevent the loss of carbon to alternative pathways by disrupting one of them. "In principle, the increased 'carbon flux' towards shikimic acid should lead to higher product levels, but in normal yeast cells, the alternative pathway that we disrupted to increase yields, importantly, also provides the energy needed to fuel the final step of shikimic acid production," said co-first author Miguel Suástegui, Ph.D., a chemical engineer and former Postdoctoral Fellow in Joshi's team and now Scientist at Joyn Bio LLC. To boost the more carbon-effective but energy-depleted engineered shikimic acid pathway, "we hypothesized that we could generate the relevant energy-carrying molecule NADPH instead in a biohybrid approach with light-harvesting semiconductors." Toward this goal, Suástegui collaborated with Junling Guo, Ph.D., the study's other co-corresponding and co-first author and presently a Postdoctoral Fellow with experience in chemistry and materials science in Joshi's lab. They designed a strategy that uses indium phosphide as a semiconductor material. "To make the semiconductor component truly modular and non-toxic, we coated indium phosphide nanoparticles with a natural polyphenol-based "glue," which allowed us to attach them to the surface of yeast cells while at the same time insulating the cells from the metal's toxicity," said Guo. When tethered to the cell surface and illuminated, the semiconductor nanoparticles harvest electrons (energy) from light and hand them over to the yeast cells, which shuttle them across their cell walls into their cytoplasm. There the electrons elevate the levels of NADPH molecules, which now can fuel shikimic acid biosynthesis. "The yeast biohybrid cells, when kept in the dark, mostly produced simpler organic molecules such as glycerol and ethanol; but when exposed to light, they readily switched into shikimic acid production mode with an 11-fold increase in product levels, showing us that the energy transfer from light into the cell works very efficiently," said Joshi. "This scalable approach creates an entirely new design space for future biohybrid technologies. In future efforts, the nature of semiconductors and the type of genetically engineered yeast cells can be varied in a plug-and-play fashion to expand the type of manufacturing processes and range of bioproducts," said Guo. "The creation of light-harvesting, living cellular devices could fundamentally change the way we interact with our natural environment and allow us to be more creative and effective in the design and production of energy, medicines and chemical commodities," said Wyss Institute Founding Director Donald Ingber, M.D., Ph.D., who is also the Judah Folkman Professor of Vascular Biology at HMS and the Vascular Biology Program at Boston Children's Hospital, as well as Professor of Bioengineering at SEAS.